SYVEC has been making environmental managing system since we got ISO14001, which is an international standard of environment, in January 1998. As a part of it, SYVEC got ISO50001 in May 2013, which is an international standard aimed to manage and improve energy consumption continuously. 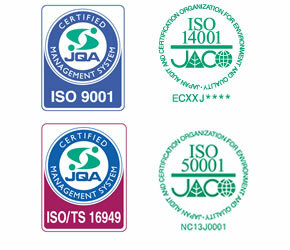 We were the first company in Nagano, and 20th company in Japan to acquire ISO50001. ISO14001 is for constructing system to manage environment generally. On the other hand, ISO50001 is for managing energy and it requires improvement of a company’s performance specifically. We need to decide base line for energy consumption based on our records for its operation, and we are required to improve our performance starting from the base line. SYVEC is establishing business continuity planning for emergency. SYVEC take recent environmental problems seriouslly, and set environmental matter as one of the most important management issues. We will put our all to preserve environment and energy by “creating a society where humans and nature are in harmony”, and we think this is SYVEC’s social responsibility. SYVEC CORPORATION has an principle to make many customers, clients, employees, and people in our local community smile with our “trust”, “technology”, and “support”. We will step up our monozukuri which contributes to reduction of environmental and energy burden through environmental-friendly technologies and products made by our cutting-edge stamping. We will list up all elements that can damage environment and energy consumption and improve from ones which may have severe influence on environment, and prevent pollution. We will save resources, commit in recycling and energy saving activities so that we can reduce burden on environment and energy consumption. We will establish products and production technology considering energy and environment and “support” environment by providing eco-firndly “technology” which our customers can “trust”. We will work with our cooperative companies to improve our actions for environment. We will obey regulations and other agreed requirements related to environment and energy and make an effort to improve the situation. We will set the purpose and target from environmental/energy-saving perspective, and review them regularly and improve management system of environment and energy constantly. We will have awareness and responsibility as a member of local community and make positive cooperatation with our community. We will make this environmental energy policy as a document, make all employees and people support us being aware of it, and make it open in public. ◇SYVEC will work on energy efficient measures against hot/cold weather. ◇SYVEC will publish a document “Beauty and Clean Project”, summarizing our activities for environment, and inform it widely. ◇We invite posters for saving energy and ecology and place them where visitors can easily see so that we can let many people be aware of environmental issues. What is Shinshu Energy Saving Partner? 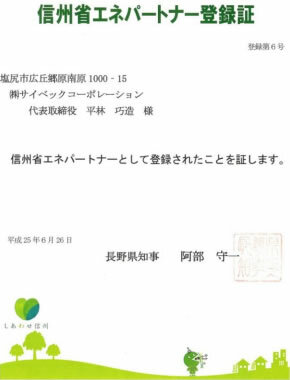 This project invites companies and groups which are willing to work on activities for energy saving and raising public awareness, and register them as ” Shinshu Energy Saving Partner”. This project is instructed under the purpose of spreading activities for energy saving, cooperating with companies and NPOs. To reduce emission of water-soluble oil solution, SYVEC installed “environmental working water” which SYVEC were testing practically in ahead. 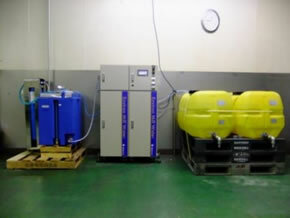 This is alkali electrolytic water made by electrolysis of water, and it is effective to reduce frequency of changing water-soluble oil solution when it is spoiled due to its characteristic of restraining breeding of bacteria.